Turf delivery is one of our biggest costs at Harrowden Turf and of course it impacts on the price of your lawn grass. In this article we look at ways in which landscapers can make long term savings by helping us to manage the cost of turf delivery. There’s no doubt about it, haulage costs are getting higher. Harrowden Turf’s Transport Manager, Richard Boyson estimates that delivery costs account for more than 50% of the supply cost for turf. And that’s before we’ve paid for the pallet, the harvester, labour the cost of turf production. Richard has been tasked with managing the cost of haulage and getting best value for our customers. His aim is to make savings in 2018 that can be reflected next year’s prices. Here’s how our trade customers can help. For trade buyers, turf haulage costs are all based on the average cost of delivery in the previous year. I’m sure you do something similar when including your vehicle running costs in a customer quote. We don’t make any profit on the haulage – to keep turf prices competitive, haulage is charged at cost. So it follows, that the lower the overall haulage bill for 2018, the less trade customers will have to pay in 2019. Savings made this year are an investment in the future. The Harrowden fleet of delivery vehicles includes state of the art rigid vehicles and of course our workhorses, the artics. It costs roughly the same to purchase and run each type of vehicle. BUT, an artic lorry carries an average of 1200 square metres of turf while a rigid can only take 650 square metres. 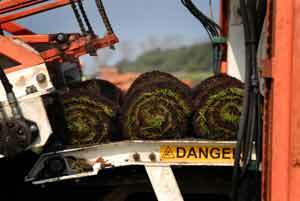 That means that the cost of delivering each roll of turf is effectively doubled when we use a rigid lorry. Please ask your team on site to double check access before you place your turf order. Fork trucks, Moffet’s are expensive to run and contribute to higher transport costs. All of our own lorries carry all-terrain forklifts and we’re more than happy to share them with you at no extra charge. However, in busy times, we sometimes have help from haulage contractors. Contractors do charge more for a lorry with forklift. Harrowden Turf absorb the cost rather than pass it on to our customers. But at the end of the year it’s all factored into the overall haulage cost and it does make a difference to the cost of your turf. If you do have access to a forklift or some sort of mechanical offloading on site, please let us know. We’re happy to negotiate delivery times with you so that you can pre-book the forklift if necessary. Remember too, if you’re not on site when we deliver, the forklift driver will know where he’s placed your turf. It’ll save you a lot of time hunting round for it. It makes no sense sometimes when you place an order for turf and our customer service team reminds you that you can save money by buying just a few more rolls. There is logic to it though. From field to finished lawn. 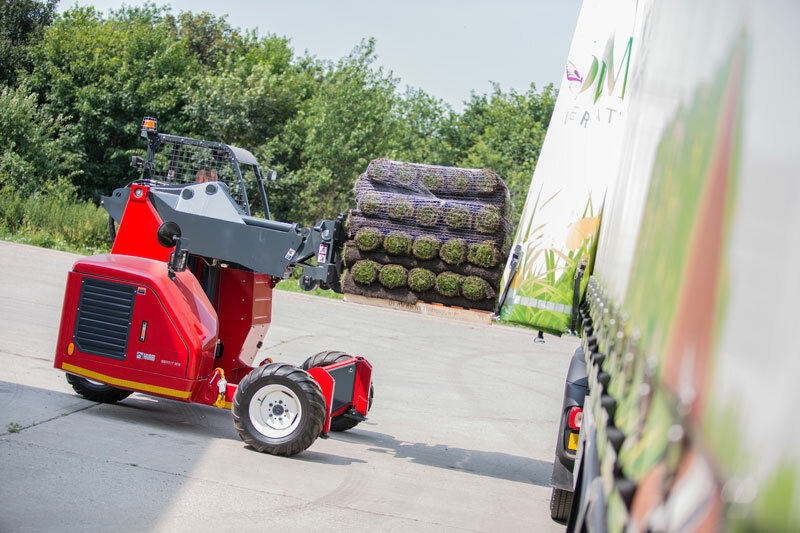 Harrowden turf aim to deliver your turf in less than 18 hours after harvest. That’s another factor that increases turf delivery prices. The cost per roll for delivering smaller orders (2 pallets or less) is significantly more than for larger orders. Because we have a limited number of our own trucks, smaller orders are serviced by a pallet network service. Every year, Richard looks for the best value pallet network in terms of cost and service, however, they are still more expensive than our own lorries. The fewer small loads we can deliver, the more savings there are to be had. It’s really easy to place an order for turf and ask for it to be delivered “first thing”. When we have 10 turf orders for a similar area – let’s say Essex and Suffolk, it’s logical to put those deliveries on the same lorry. That will save in fuel and labour costs. However, only one or two of those deliveries can realistically be delivered before 7.30 am. If all 10 orders need to be there early, of course we’ll do our best, but that may mean sending 5 vehicles, 5 drivers and 5 tanks of fuel to do a job that should be achievable with 1 vehicle. If you are arriving on site at 7am and plan to prep the ground before laying the turf, do you really need it sitting in your way from 7.30 onwards? Could we deliver at 10.00 am instead? The one thing that Richard wanted me to stress in this article, was that Harrowden Turf don’t want to compromise customer service to cut costs. If you need your turf delivered at 7am on a rigid vehicle, that’s what we’ll aim to provide. (UK road systems allowing!). However, if your site can cope with an artic lorry and has a forklift on site – that will be enormously helpful in our quest to minimise delivery costs.